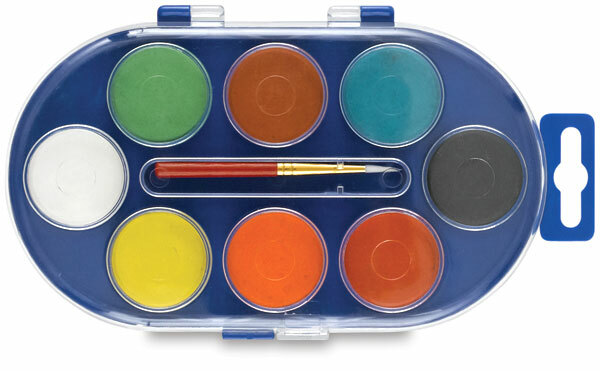 These premium quality opaque student watercolors are priced for schools or workshops. A brush is included in all sets. Pan Sets — The pans in these sets measure 1-1/8" (28 mm) in diameter. They are set in a plastic tray featuring a hinged cover with built-in mixing wells. 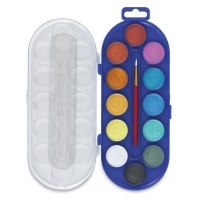 Palette Shaped Tray — This set contains 12 pans measuring 7/8" (22 mm) in diameter, and has no cover. Pearlescent Colors, Set of 12 — This set includes Charcoal, Mirror, Yellow Gold, Gold, Deep Gold, Copper, Black Cherry, Orchid, Emerald, Blue, Aquamarine, and Forest.